The Quintessential patrol m4- always ready for action? My rifle, what dya think, seems to be a good set up, any comments? Looking good. Slap a tracer unit on it and your laughing! i Have a serious Aversion to Tan Though! Whats the thing on the stock? I do believe they have banned that shade of blue now, glad I got it when air soft world were selling it though! 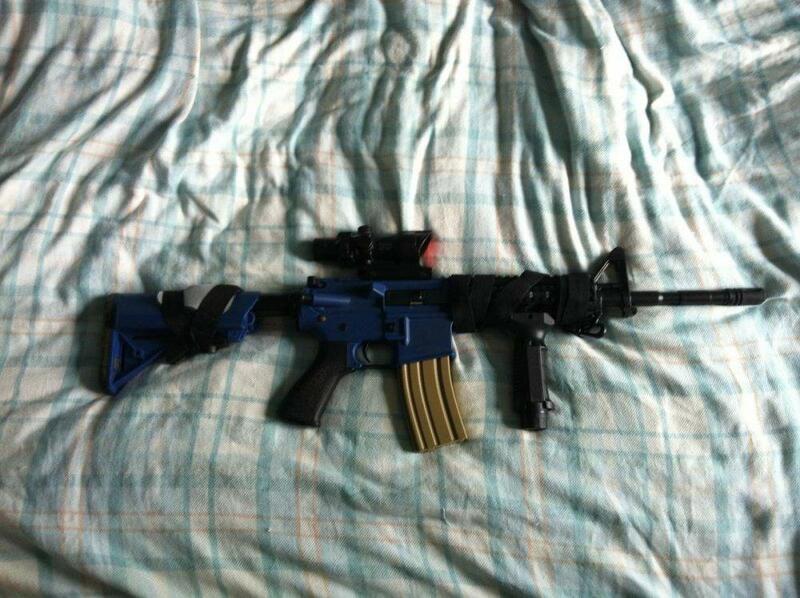 The bit on the stock is just some cheek rest padding i threw together, the acog rides quite high. Its a mid cap i found on the floor at my last skirmish!, I have two steel g&g high caps, but they are bigger than the real steel stanag mag and looks rather funny- but great for hosing down oppo with my silly rate of fire! What internal upgrades did you get? Nothing wrong with tan "/pats tan cm16 raider l"
What's it's fps now then? shouldn't this be in gun pic thread ???? ist that abit "hot" or is it DMR?